Spoke, Zoominfo, and Jigsaw are websites that contain information on 10’s of millions of people and millions of companies. Each site has their own special method of capturing information on people and businesses. What they all have in common, however, is that while you can register and in some cases even run a few searches for free, you have to pay to really dig into their information. So – would you like to know how to search these sites for free? Yes? Well you’re in luck – that’s exactly what I’m going to show you in this post. Searching these sites for free is actually quite simple. 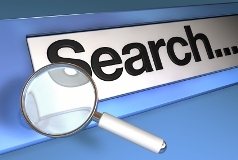 While the X-Ray search technique is frequently utilized to search LinkedIn and to search Twitter, it can be used to search virtually ANY site that allows Internet search engines to index their pages. Sites like Spoke, ZoomInfo, and Jigsaw actually WANT search engines to crawl their information so when you’re on Google and search for a specific name, results from their websites come up – it’s free publicity for them and it drives people to their sites. For example, when I search for my name on Google, on the first page of results, I find a listing for me on Spoke that’s actually ranked higher than Facebook. But there is a price to be paid when you allow an Internet search engine to index your site – people can use the X-Ray search technique to search your website for free. Be aware that information aggregated from the Internet may not be accurate or up to date. 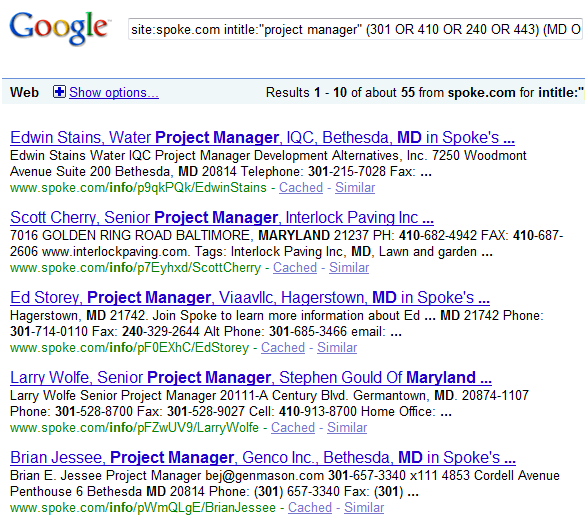 Also, don’t expect to find many direct phone numbers or email addresses when searching Spoke. However, you can search Spoke by title, industry, and location related information by city, state, and/or area code in some cases if the data is there. 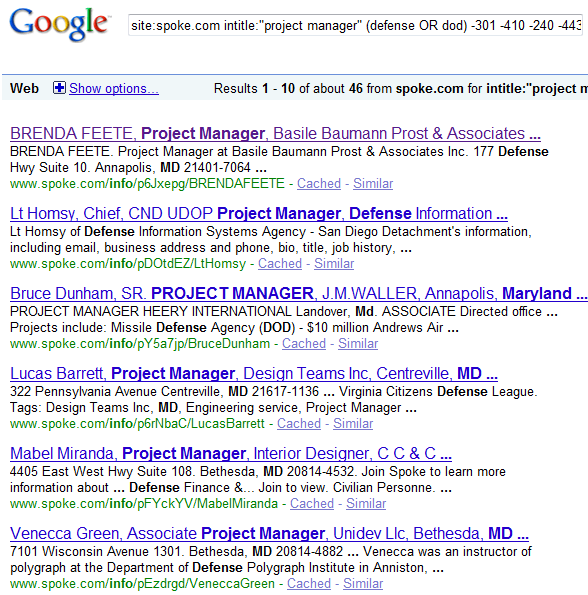 Let’s say you wanted to find project managers in Maryland. That search returns about 3910 results. To reduce the number of results to a more manageable number, we can start adding terms to refine the results. You could experiment with industry terms, technology keywords, specific cities, etc. That search returns 46 results. Result #2 is from San Diego, CA, and result #5 is a project manager/interior designer, but most of the results are relevant. Always remember you’re X-Ray searching a site trying to target unstructured data for free – don’t expect perfect results every time. You need to be aware that because most of the information contained on ZoomInfo is acquired by software searching the Internet for information and compiling it, not all of the information will be accurate or up to date. Having said that, ZoomInfo has information on nearly 50,000,000 people and over 5,000,000 companies – that’s a lot of information! That search returns 169 results. As you can see, the information ZoomInfo gathered from the Internet on Mary to create her profile is quite detailed. 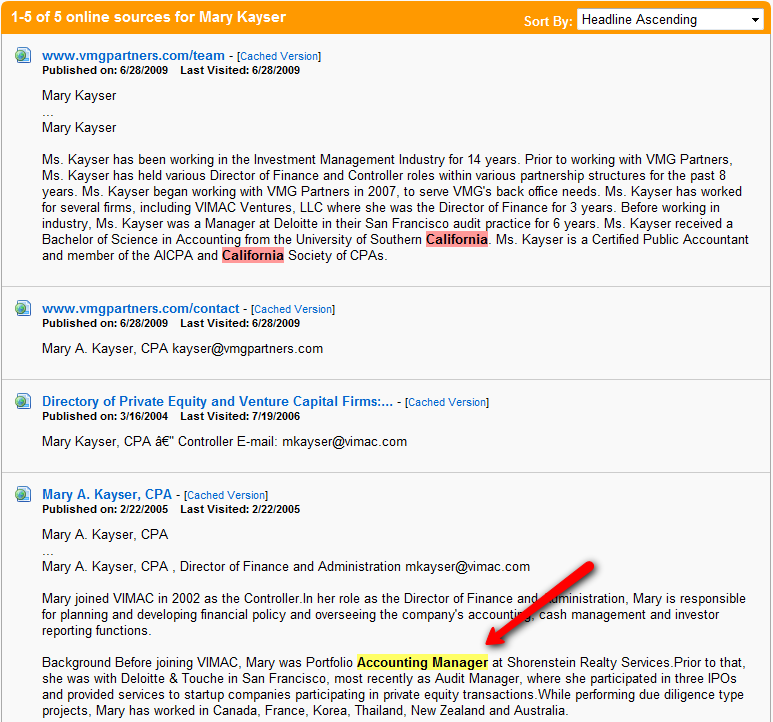 However, Mary is not currently an Accounting Manager. You must never forget you’re using the Internet to search for unstructured data for free – so be sure to manage your expectations. What you do get is easy access to quite a bit of data. 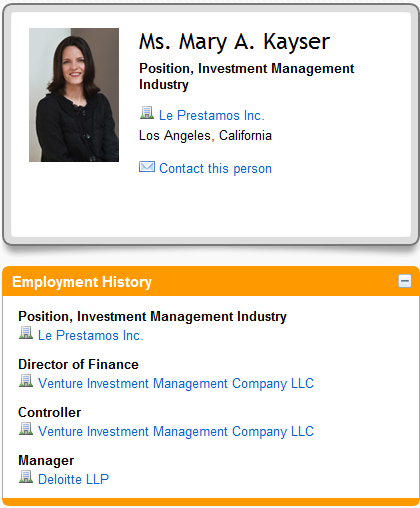 In the case of Mary – while she’s not an accounting manager, she is a high level finance and accounting executive. If you explore the rest of the results, you will find a mix of accounting managers, directors of finance, controllers, VP’s of Finance, etc. It does not appear to be terribly useful to try and X-Ray search ZoomInfo to find local results using area codes – so when you’re trying to find people in a specific area, I suggest targeting cities and states. Jigsaw describes their site as “an online directory of free, downloadable Company information and more than 14 million business contacts. 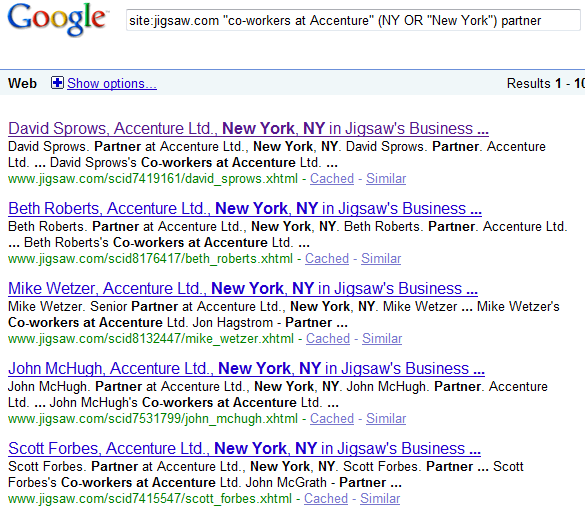 Every Jigsaw business Contact is complete with hard-to-find direct dials and email addresses.” You can join Jigsaw and even run a few searches for free, but in order to continue searching their site for contacts, you will either have to add contacts of your own to earn “credits” or you can simply purchase them. Lucky for you, Jigsaw is indexed by Google and other Internet search engines, so you can search for contacts for free with some degree of reliability. 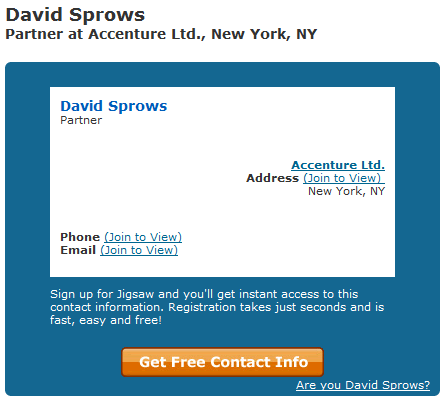 Diving into result #1, we can see David is listed as a Partner with Accenture in NY. 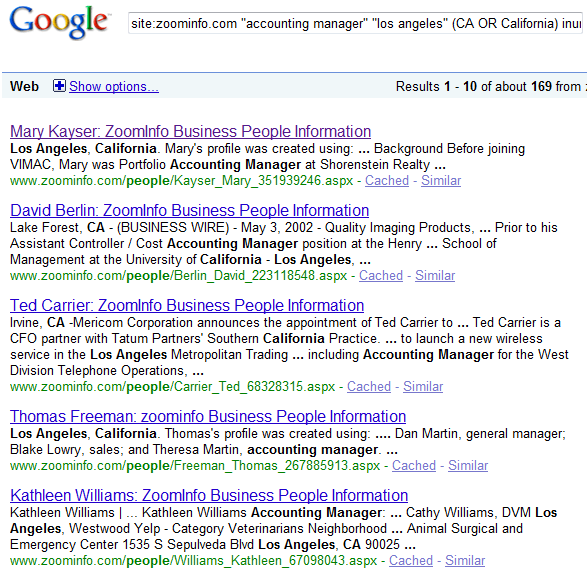 You can search sites such as Spoke, ZoomInfo, and Jigsaw for free and generate quite a few names. However, you’re searching unstructured, and in many cases old/not recently verified information on Internet data for free. There is no guarantee of the accuracy or the “freshness” of the data. Also – if you want the ability to precisely control current titles, employers and specific locations – you’ll have to pay for access to the websites containing the information you seek. With access to LinkedIn – do you really NEED to search Spoke, ZoomInfo, and Jigsaw to find candidates and business contacts? 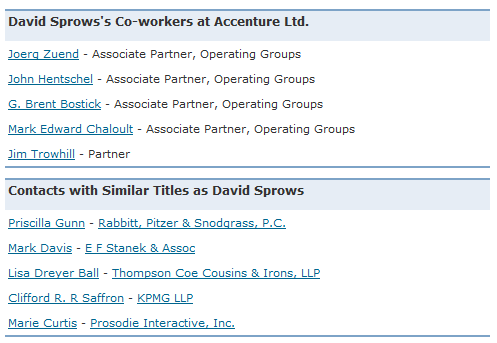 I’m not sure exactly how much overlap there is between LinkedIn and sites like Spoke, ZoomInfo, and Jigsaw, but I am certain that there are quite a few people on the latter sites you cannot find on LinkedIn. LinkedIn profiles are created by people – most of the information on sites like ZoomInfo and Spoke is aggregated and compiled by applications drawing data from the Internet and various forms of published data. I am positive there are many people who have automatically generated profiles on Spoke and ZoomInfo that have not personally created a social media profile anywhere. The key to being successful with X-Ray searching most websites is to experiment, experiment, experiment. If at first you don’t find what you seek, change your approach, modify your search string, and see what you get. Use alternate titles, specific companies, industry terms, and try different location criteria/terminology. 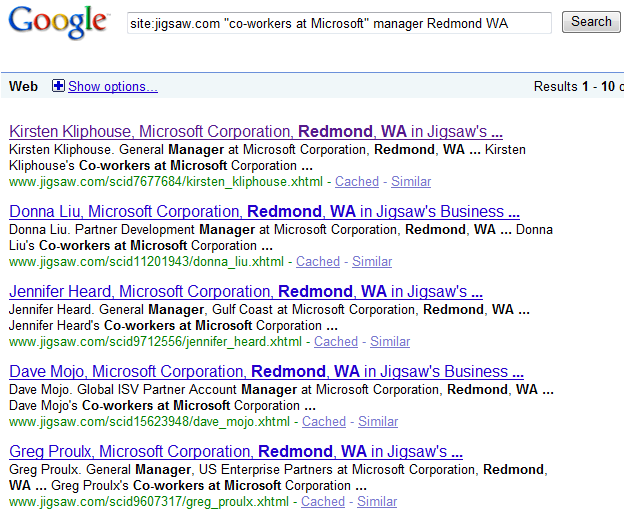 In my experience, the three sites I featured in this article work best for simple title searching. Also – pay attention to false positive results – results that mention your search terms but are not matches for what you’re really looking for, and try to modify successive searches to prevent false positives from occuring. Always remember, with this type of searching, it is nearly impossible to prevent all false positive results without comprimizing relevant results.